You are here: Home / What is YEN? 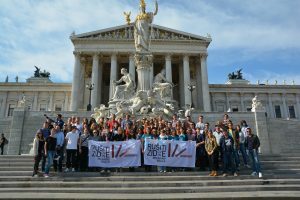 The Youth of European nationalities (YEN) is a dynamic and active network of youth organizations in a multicultural and multilingual Europe, representing their interests. The main goal is to work for the preservation and development of the rights of the minorities and ethnic groups. YEN is a competent partner for all questions concerning youth minorities and creates awareness within the majority population for issues concerning minorities and ethnic groups. Therefore YEN uses various possibilities of public relations and lobbying to influence on different levels and to articulate the rights and needs of minorities. … out of the 453 million people living in the European Union, 37 million consider themselves a part of an ethnic or national minority and did you know that 156 ethnic and national minorities are resident within the EU? … within the 45 countries of Europe 337 ethnic and national minorities live with almost 100 million members? That corresponds to 14% of the European population or to every 7th European. … there are 90 languages in Europe, whereof only 37 are spoken as national languages? 53 of the languages are considered to be “stateless languages”. … the critical edge for the survival of a language is estimated on 300.000 members? This means that about 80% of the European minority languages are endangered. Therefore it is necessary to protect and to foster the European minorities. … that minority rights are human rights?